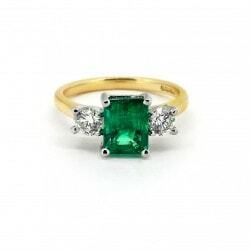 18ct Emerald Cut Emerald and Round Brilliant Cut Diamond Three Stone Ring. Prices From £1500.00 but this particular commission pictured was £3500.00. We are always happy to work to a budget if you have one in mind. This ring is available on Interest Free Credit, subject to terms and conditions.